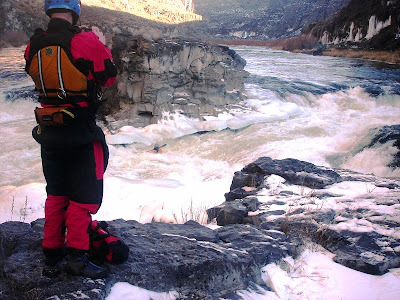 A group of 10 of us went and hit the Murtaugh Canyon on the Snake River on the 28th of January. 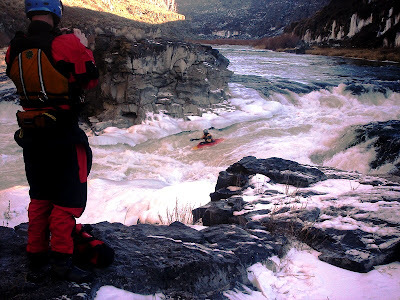 That was my second time running this run and the time before i ran it at 2200 which seemed a little more subdued than at this flow, though i hear 1200-1800 cfs and above 10,000 cfs is the best. IMO 3000 cfs is a GREAT flow for this run. Everything seems to have big hits but no consiquences. Great class 3-4 action. This time of year the scenery was amazing, all the waterfalls that are there in the summer are frozen and make amazing ice formations. The water is rather cold though and we were lucky to not have any wind for the paddle out across the lake. The only real class 5s on the run at that flow would be Door number 5 on Lets Make a Deal and Pair-O-Dice. The only pictures I have are from Pair-O-Dice. Author entering into Pair-O-Dice. Notice the ice undercuts on the edges, thats where the boil that you had to ride down wanted to take you.